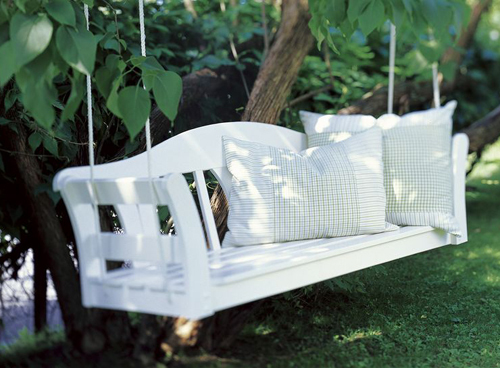 Today I am loving … this DIY project for a hanging bench that I found on Sweet Pauls’ blog. Paul used a simple a white painted bench from IKEA with the legs sawed off. Two holes were drilled on the end of each side and a thick rope was pulled threw it. Then hang it from a strong tree branch. Indeed the perfect place to read the paper while sipping on a cocktail! Change the text “pulled threw it” in “pulled through it”?